We admit it – when we first made the leap and started using reusable straws as an alternative to plastic it was a big transition. It sounds silly, but since our juice box days, we’ve always just taken and tossed out disposable straws. They’re easy (and we like easy) but something about seeing that poor turtle with one stuck up his nose, made us think – we need to contribute to a change. Businesses need to contribute to change. People need to contribute to change. We dove in here at ePromos, and no doubt, it’s been a game-changer. You just FEEL better knowing that you’re making a difference. 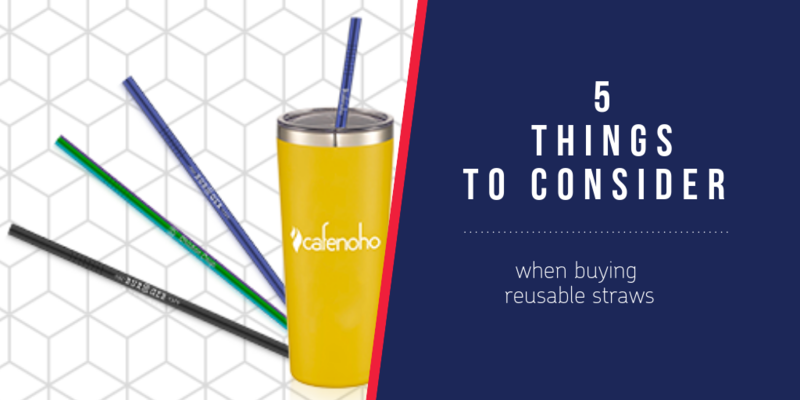 That said, WE KNOW – you’ve heard the stats, you understand the reasons to ditch plastic and, maybe, you have been kicking around the idea of incorporating reusable straws into your business. 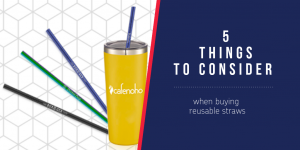 So, let’s skip the “why-it-matters” diatribe and jump right in to the “2.0” of it all – specifically, what to consider if you want to go all-in on reducing plastic waste and going with reusable straws. Stainless steel has quickly become the ubiquitous reusable straw, and with good cause. These go-anywhere, do-anything straws are super sturdy and work well in both hot and cold drinks. And, because they’re made of stainless steel, they can be tossed into a reusable baggy and toted around all day long without risk of bending, chipping or tearing. Of course, there’s something to be said for paper – it’s NOT plastic, specifically. While you’re still tossing paper straws after a single use, they do disintegrate and are considered “recyclable”. But, if your purpose is to go the extra mile, re-use and make more of a statement, stainless steel might be a better option. Still not sold on stainless? We get it – we’ve heard everything from a fear of chipping teeth to the fear of too-hot drinks burning sipper’s gums and lips. So, in this side-by-side example, consider the alternative. You could opt for a “true” stainless steel straw which, again, has become the standard on the reusable front, or a silicon-tipped option which softens the experience – literally. Either way you’ll get the same benefits, all in a compact and environmentally-friendly package. The age-old debate: straight versus bent straws. If you’re a kid or a kid at heart, this one’s a no-brainer – bendy straws are where it’s at. But let’s consider the pros and cons to each – because, believe it or not, there are tangible benefits to sipping straight or on a slant. First, the bent or “bendy” straw. They were designed in the 1930s, with the express purpose of helping people who couldn’t belly up to the bar and bend their heads enough to sip from a straight straw. That’s still the perk of the bendy straw – it’s easy to drink from almost any angle. But before you rule out the classic straight straw, consider this – bendies can be a bit shorter than straight straws, making it tougher to get that very last sip. With a longer, straighter straw, sucking up that last bit of milkshake/cold brew/green juice is easier, cleaner and more efficient. Most straws range from about seven to 10 inches. The consideration? See the bendy versus straight debate, above. If straws are on the longer side it’s easier to get your sip on all the way to the bottom of the glass, can, or bottle. But, at the same time, a longer straw can be tougher to maneuver, especially if you’re shorter or tend to sit lower at your desk or table. Like the other considerations here, there’s no right or wrong – just what you and your clients prefer sipping-wise. The final piece of the puzzle: how you’ll package (or not package) your branded straws. Think about it – if you’re doing your part to curb waste and save the environment, you may consider opting OUT of elaborate packaging. Or, opt for packaging that does double-duty – a reusable straw with a case of some sort. Our customers seem to love bank bags to use for this purpose. It’s a win for you (don’t you look generous…? ), a win for your client who scores a bonus gift and a win for the environment. Really, what could be better since the reusable straw trend is here to stay. Check out October’s Product of the Month. Contact an ePromos expert to learn more and explore your options now.